Last week our friend Richard Wedepohl visited the farm. Richard, Joe and Arik checking out one of the farm's ponds. We had some catching up to do on Wisconsin government affairs, but also wanted him to check out a few of our many ponds. Richard spent his career as a waterways engineer with the Wisconsin Department of Natural Resources and really knows his stuff! 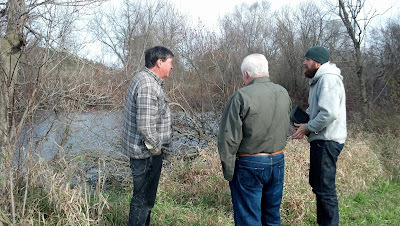 Richard gave us some good ideas - methods to clear up algae, how to keep drainage tracts open, and ways we could even establish a "private pond" on the farm. We'll definitely be putting his recommendations to use in the near future. Thanks Richard!